Don’t you know the ASRock Z77 Extreme11 yet? That extreme plate had fourteen SATA connectors thanks to an extra SAS controller LSI. 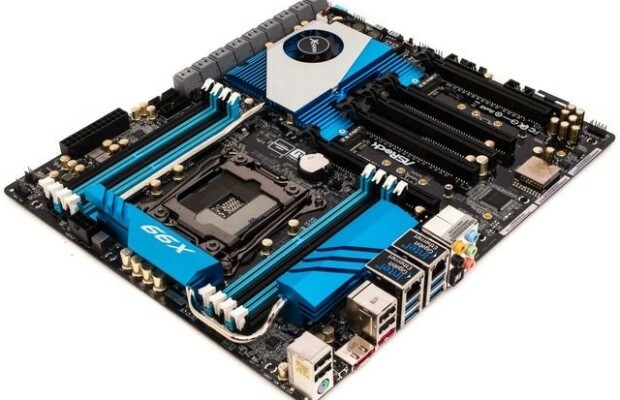 The X99 chipset delivers ten SATA600 ports themselves, but on the X99 Extreme11 who recently reached the test lab are a total of eighteen SATA connectors: so much more extreme. The price for the most expensive socket 2011 motherboard ASRock has in any case already inside. If you look at the board, is in addition to the huge amount of SATA ports also the fan on the chipset. Active cooling on a motherboard we see never really anno 2014. Now the chipset can best be passively cooled, but under the heatsink are also still an LSI SAS 3008 controller and two PLX PEX8747 switches that divide the PCI Express lanes. The connections for storage are clearly the most important unique selling point of this motherboard. Come as said ten SATA600 interfaces of the chipset, exported all internal. In addition, we find eight SAS600 ports back, which of course you can also connect SATA disks. The back is also a further two eSATA ports but share their bandwidth with internal connections of the Intel chipset. SATA Express is absent, but the standard was actually at launch already declared dead. As we know from ASRock have two M.2 sockets four PCI-Express 3.0 lanes bandwidth, but the second lock is not useful in a Core i7 5820K with 28 lanes, of which more later. ASRock has a 12-phase power supply implemented, whereby it has selected coils 60A, Dual-N-MOSFETs and 12K Platinum Nichicon capacitors. Two Molex connectors provide extra puncture for the video cards. Everything is soldered on a black board, while the heatsinks of blue tones are provided. As in virtually all Extended ATX boards also sit on the X99 Extreme11 five PCI-Express 3.0 x16 slots. The lane layout in CrossFire or SLI can be found in the table below. With two PLX PEX 8747 switches are extra lanes available, making even four graphics cards full 16 lanes per card are available. This can even be in combination with the two-M.2 3.0 x4 locks. If the LSI SAS controller is used to get the video cards in slot four and five eight lanes, while the cards in slot one and two still receive sixteen lanes bandwidth. The i7 5820K has 28 lanes and therefore there must be somewhere in cut. The PLX-bridges, the four key locks still sixteen lanes bandwidth, but the uplink of the bridges itself limited. The first bridge gets eight or sixteen lanes, depending on whether the SAS controller is used, while the second bridge, there will always get eight. That means that there remain four lanes from the CPU for one M.2 SSD. The lower M.2 socket can be used for communication via the SATA protocol, but you can not then PCI-Express SSD lost there. The I / O panel has four USB 3.0 ports, two of which come directly from the chipset. The other two ports from a ASMedia ASM1042 controller, which one PCI Express 2.0 lane to two USB 3.0 sales – no hub so. The number of four external USB 3.0 ports is given the further equipment of the board may be somewhat scanty, though we own not think of a reason why you would want to use five or more connectors. In addition to the external USB 3.0 connectors, we count four USB 2.0 ports. Internally, you’ll find two USB 3.0 headers and as many USB 2.0 headers, all of which involve their bandwidth from the chipset. The Extreme11 board has two Gigabit network connections. The first Ethernet port is powered by an Intel I218V controller, the other by an Intel I211AT. Wireless Internet access is not available. However, ASRock XFast delivers the LAN software with which you traffic from certain programs can prioritize. Also on this board audio is controlled by a Realtek ALC1150 codec. Under the slogan Purity Sound 2 fall further audio capacitors from Nichicon, a TI NE5532-amplifier for headphones and shielding, making it the audio supply PCB is isolated. Internally, we take a total of six fan connectors: two for the CPU (1x 4-pin, 1x 3-pin), three for the case fans (1x 4-pin, 2 x 3-pin) and one 3-pin power fan . Furthermore, the X99 Extreme11 also has dual-BIOS, power and reset buttons and a debug LED. Also ASRocks HDD Saver feature, which you hard drives and SSDs can provide via the motherboard power is present. Average cost ASRock X99 Extreme11 currently 671 euros. This is officially the most expensive X99 motherboard; almost 200 euros from the number two even. The sound quality of motherboards we tested using the loopback test RightMark Audio Analyzer. Please note: we can simultaneously test the quality of the output and the input of the onboard sound cards. The “weakest link” determines the outcome. The dynamic range and noise level tests are very similar and show virtually identical results. The dynamic range test measures the difference in volume between the loudest and softest take signal, the noise level test measures the difference between the loudest sound and the noise level. To put the numbers in perspective, the highest dynamic range or noise level with 16-bit sound is theoretically possible, is 96 dB. 99.9% of the sound that you listen to on your PC (CD, MP3, YouTube, games, …) is 16-bit and the graphs show so that the hardware in almost all cases, no restriction. The higher scores, we can achieve only by testing with 24-bit audio. We can not imagine that there are incidentally us but someone who can actually hear the difference between 91 dB and 100 dB signal / noise ratio. Both the dynamic range and signal / noise ratio are very good, but do not belong to the absolute top. The difference will be not actually perceptible in practice. 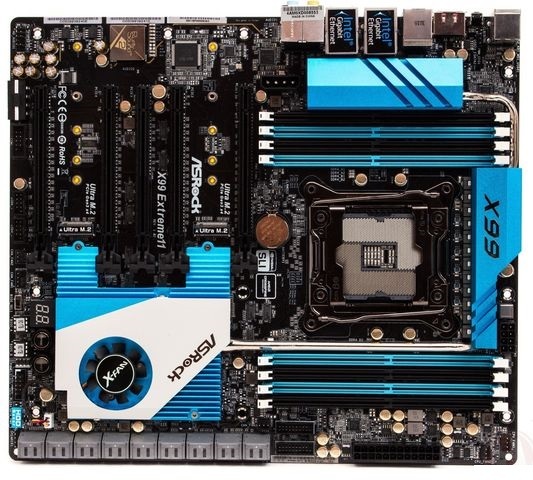 ASRock X99 Extreme11 is a product in itself – not even any other X99 motherboard comes even close to the number of SATA connectors on this board. Thanks to the PLX switches the video cards have always sixteen lanes available, while there can even be used with a 28-lane CPU a 3.0 x4 M.2 SSD. About the audio and network chips we have nothing to complain. Besides his exorbitant price the Extreme11 still has a few drawbacks. Thus, the power consumption is significantly higher than that of most other boards, all depends mainly together with all the extra chips, which add functionality again. Regrets that ASRock has chosen active cooling on the motherboard: small fans are never really silent. For a board of 700 euros was our best yet more extreme liked: Integrate a Thunderbolt connector of the newest type and possibly also 802.11ac WiFi then you only really the ultimate motherboard with all the trimmings, for as it you anyway no matter how much you spend. The awards we keep in the closet, but for a very select group will be a very complete motherboard.